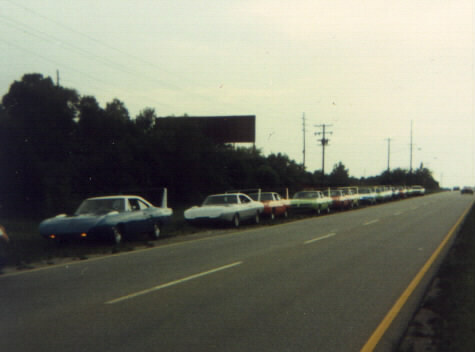 In the summer of 1975, there were four wing car groups that agreed to meet for a joint event at Talladega Superspeedway, for the first ever National Wing Car Meet. At the time, I was 13 years old and was very anxious to attend with my father. 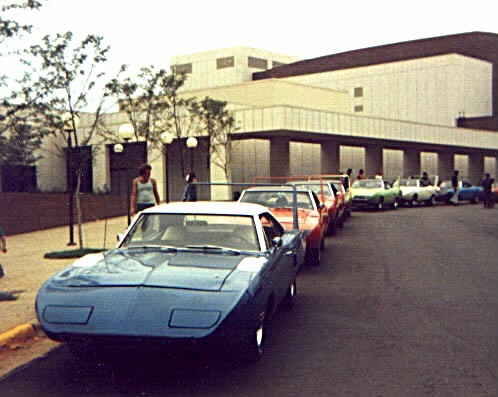 We left Milwaukee Wisconsin early Friday morning in our green Superbird, with another yellow Superbird, driven by Chuck Sosinski in tow. This was the first trip we had ever made in our 8600 mile Bird which we had purchased in 1972, and had pretty much been mothballed since. 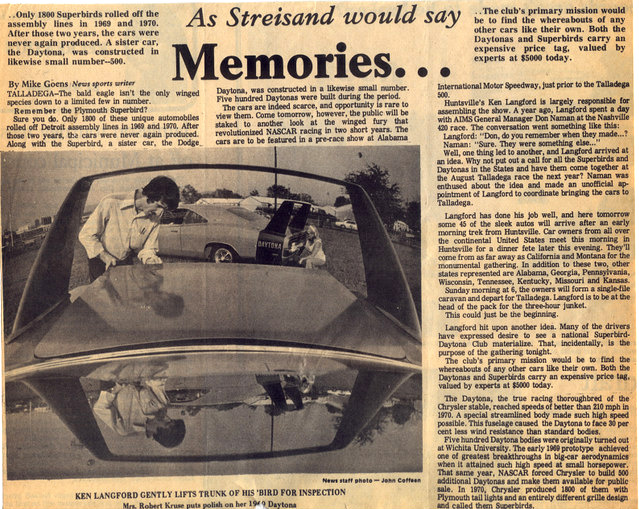 Dad had bought our car as a collectible back then, but had kind of a "What do you do with it?" attitude. 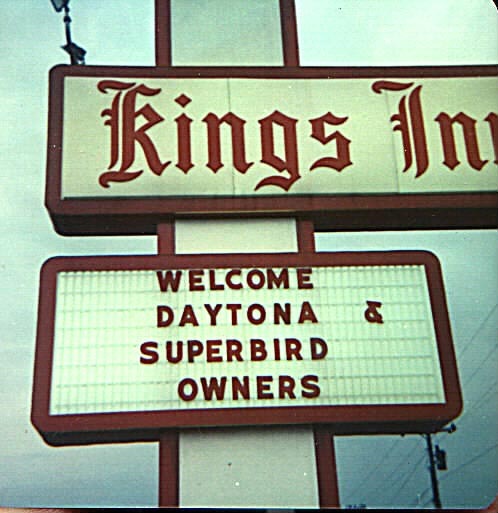 After running an ad in Hemmings in the Spring of '75 to start DSAC, then known as Superbirds of America, he discovered there were three other groups out there trying to do similar things. Our miles rolled by uneventfully, and we arrived at the Kings Inn in Huntsville Alabama very late Friday evening. 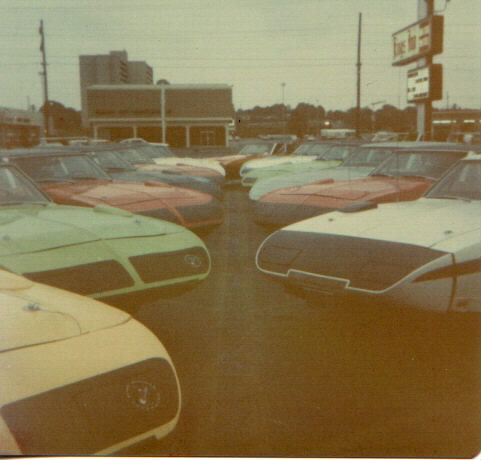 Several Superbirds were already there. By morning,more cars were arriving. 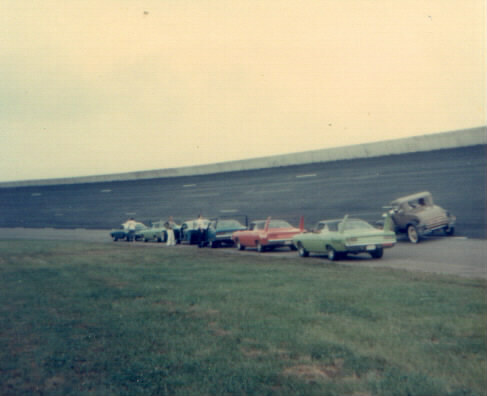 This was very exciting because most of us had never seen that many wing cars in one plate at one time. One of the great cars at the meet was the Keith Black Orange County Dodge Dealers Daytona, then owned by Gilbert Tarr. 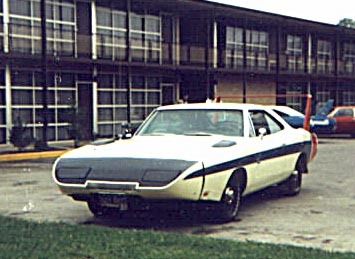 Gilbert drove this Hemi Daytona from southern California. 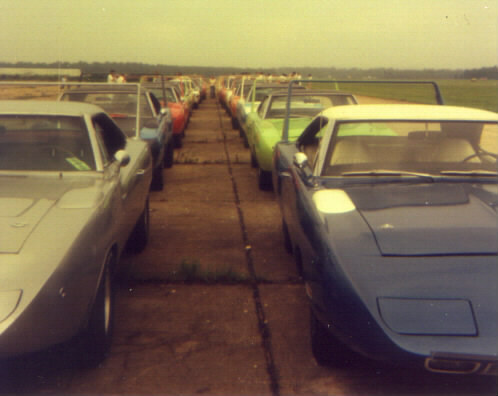 Our host for the event was Ken Langford, from Birmingham Alabama, Ken owned the blue Superbird here. The white top was not factory. Ken was the man who organized the event and arranged the track laps for us at Talladega Superspeedway. Saturday afternoon, we all got together and drove as a group over to the Werner Von Braun Civic Center in Huntsville and took this group photo. 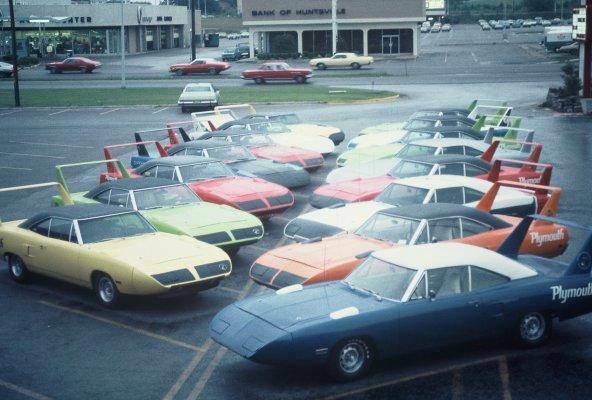 We did not know it at the time, but Chrysler's personnel in Huntsville were very instrumental in the creation of the winged cars. Many of them had been involved in the rocket and missle program that Chrysler had. When Chrysler lost the Saturn V rocket contract to McDonnell Douglas, some of those people came over to the race project and helped with developing the instrumentation and aerodynamic developement. Back at the hotel Saturday afternoon, we organized the cars nose to nose. It was getting ready to rain so the photo isn't the best. Sunday morning we left from Huntsville to go to the track. It was a pretty good ride and we left in the dark, so we are now pretty close to the track. 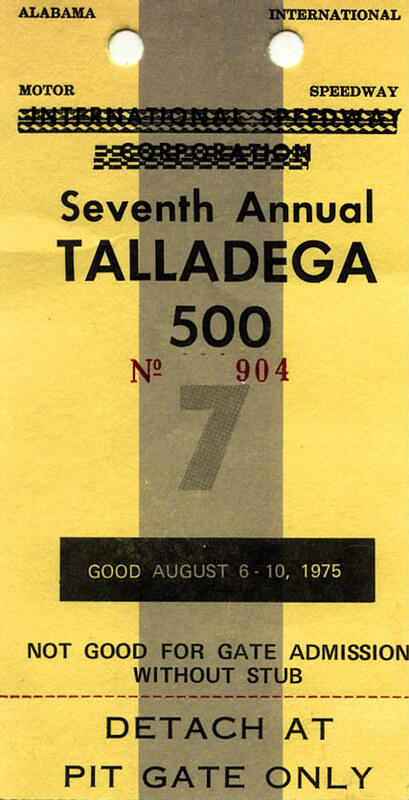 Our Talladega 500 race ticket. On the great track at last. Check out that Model A. It looks like if it goes any higher it will fall off the banking. Well we had some sprinkles on the parade lap, and afterwards, it turned into a downpour. The race was delayed until the next weekend. Unfortunately for us, we were already back home. Here is the article that appeared in the local newspaper on Saturday. If you would like to read the whole article, click on the blue link below to see it full size.